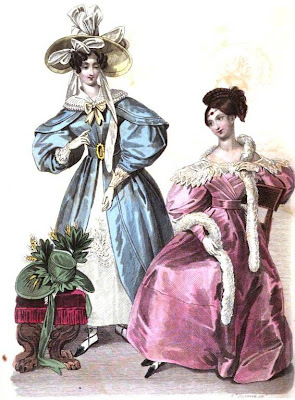 are you curious to know what dress styles were fashionable in November 1831 in England and France? Then, let’s take a look at some of these dresses below, shall we? I have to admit the only dress I like is the English dinner dress. The color is beautiful and I love the ferroniere on her head, although I’m not too keen on the sleeves. And the sleeves are the reason why I don’t like the other dresses (love the skirt of the French opera dress though). I don’t know what they were thinking making sleeves so big, they just look silly. What do you think? A dress of white chaly, finished round the back part of the corsage, which is of a three-quarter height, with a triple fold disposed en pelerine, and descending on each side of the front in the form of an X; immediately above this trimming a light bouquet is embroidered in the centre of the bosom, in pearl-grey silk. The sleeves are of the gigot shape, embroidered at the hand in pearl-grey silk. A Grecian border is worked in light waves above the hem, and bouquets issue from it at regular distances. The pelisse worn over this dress is of pearl-grey gros de Tours. The corsage, made up to the throat, but without a collar, has a slight fulness at the bottom of the waist, before and behind. The pelerine is of moderate size, and very open on the bosom: it is trimmed with a satin rouleau, to correspond, placed at some distance from the edge. The sleeves are of the gigot shape, and of the usual size. The pelisse is open in front, and a little rounded before in the tunic style. It is trimmed down the fronts, and round the border, with a satin rouleau. Collerette fichu of white tulle, trimmed with the same material, and sustained round the throat by a neck-knot of straw-coloured gauze ribbon. The manchettes are also of tulle. The hat is of straw-coloured gros des Indes; a round crown of moderate height: the brim, deeper and wider than they have lately been worn, is trimmed on the inside with light bows of rich white gauze ribbon; a band of ribbon crosses the crown, and a profusion of bows are placed in front. A dress of rose-coloured gaze Polonais, over a gros de Naples slip of a similar colour. The corsage is cut low; it sits close to the shape behind; the front is arranged in folds which cross so high in the centre of the bosom, that very little of the blond lace chemisette is seen. The sleeves are between the gigot and Amadis form, but incline more to the latter shape. The chemisette is made with a round collar, which falls low over the back and shoulders, and is trimmed with a double fall of blond lace. The hair is parted on the forehead, and arranged in a platted braid en couronne on the summit of the head. The ends of the braid, disposed in corkscrew ringlets, fall over the comb placed behind the couronne. A ferroniere composed of gold chain, with a ruby agraffe, is brought rather low upon the forehead. The jewellery worn with this dress should be of gold and rubies. Swansdown boa tippet. It is composed of green satin; the shade is that called vert des Indes; it is of the capote shape, but the brim is somewhat larger than usual, and is lined with white satin, upon which blond lace is arranged en evantail. The crown is trimmed with sprigs of foliage, composed of a mixture of satin and gros des Indes, and intermixed with ears of ripe corn, of the natural colour. The curtain at the back of the crown is formed by a wreath of leaves. The mentonnieres are of blond lace. A dress composed of rose-coloured chaly, a low corsage finished by a lappel of a perfectly novel shape, which falls very far over the sleeve, and is embroidered in a light running pattern in white floize silk. The sleeves are between the Amadis and gigot shape. The fronts and border of the dress are embroidered en tunique in white floize silk. The embroidery, narrow at the waist, becomes progressively broader, and is very rich round the border. The chemisette, which falls, en pelerine, over the bust of the dress, is trimmed with a double fall of blond lace, set on with very little fulness; it is fastened in front by a richly-chased dead gold brooch. 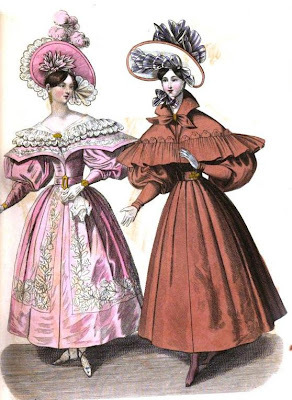 A rose-coloured crape hat; the crown is low, and round; the brim, short at the ears, and rather deep, is ornamented on the inside with palmettes gauze ribbon to correspond: on the outside is a blond lace drapery which falls a little over the left side of the brim, turns back en bavolet, and passes under the right side, where it meets the palmettes. This drapery is ornamented with a loose rouleau of gauze ribbon, terminated at each end, by a full bow. A bouquet of rose-coloured ostrich feathers, is placed near the top of the crown on the right side. The hair is parted on the forehead. Ear-rings, bracelets, and ceinture buckle dead gold. A high dress composed of gros de Naples; the colour, a new and extremely rich shade of brown. The corsage, made to sit close to the shape, is ornamented in a very novel style with a row of points lightly embroidered, which forms it in a heart shape before and behind. The sleeves are a l’Amadis. The pelerine is made with a standing three-pointed collar, which descends in front in the lappel style. A very broad trimming is set on full round the border of the pelerine: it is surmounted by a row of pattes with a gold button in the centre of each. Satin hat of the same colour, lined with white satin but bordered with the material of the hat round the edge of the brim, the inside of which is trimmed with coques of lilac and white striped gauze ribbon. Bands and bows of ribbon arranged in a novel style decorate the crown. Neck-knot to correspond with the dress, fastened by a gold clasp. Bottines of chocolate-coloured gros des Indes. A sable boa tippet, or cachemere shawl, should be thrown carelessly round the shoulders.